The women's restroom has two completely private bathroom stalls with floor to ceiling lockable wood doors. The men's side has one spacious bathroom stall. Each of the stall doors are custom painted with a glaze using a strié design. 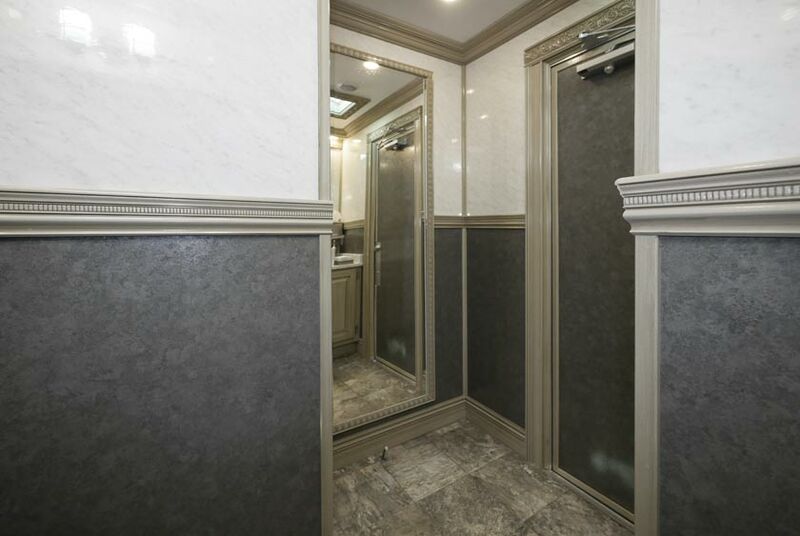 The extensive details of the bathroom stall doors include a lavish French Renaissance satin nickel door set in a "Blois" pattern designed by P. & F. Corbin in 1905 which have graced the finest turn of-the-century homes. 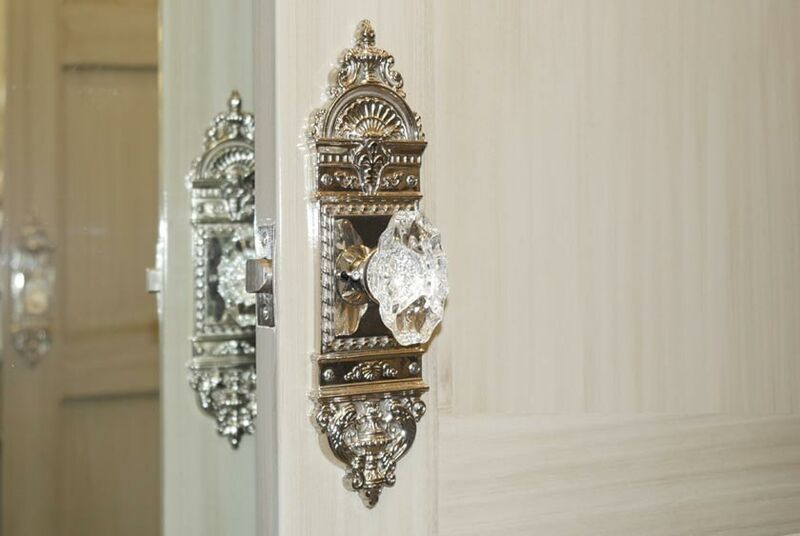 Brilliant lead crystal knobs complete the regal look. 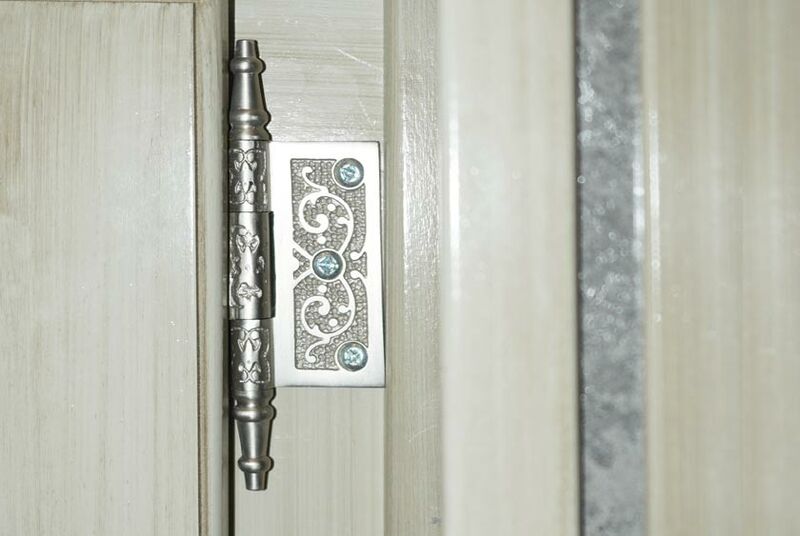 Victorian elegance is enhanced with solid brass steeple hinges with an elegant vine pattern in satin nickel finish. There is also a satin nickel coat and hat hook on the interior of the bathroom stall door for convenience. 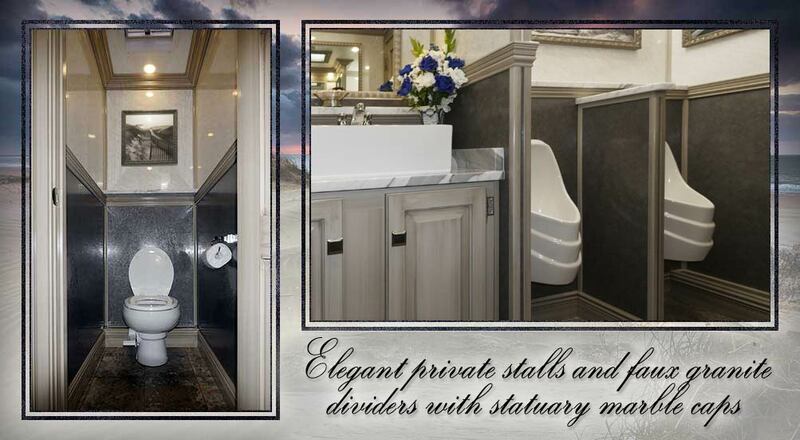 The men's restroom has two porcelain waterless urinals with a faux marble privacy divider with statuary marble cap. 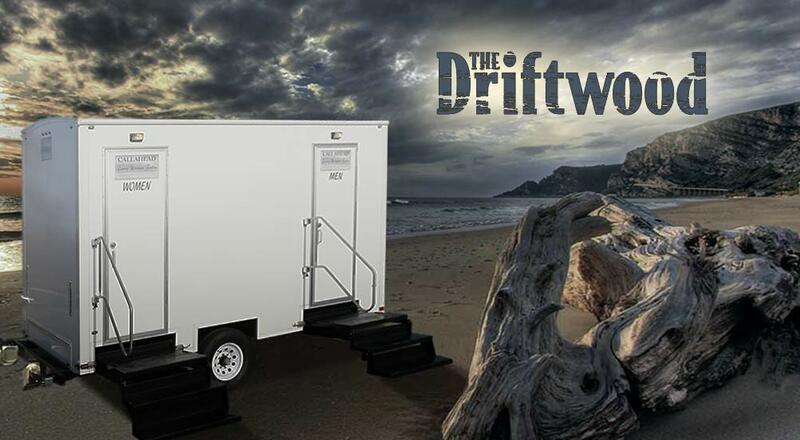 The DRIFTWOOD LUXURY RESTROOM TRAILER can be used for day or evening events. A bright white exterior equipped with an outdoor lighting system will look great in any location. The women's and men's restrooms have separate marked entrances for convenience and comfort. 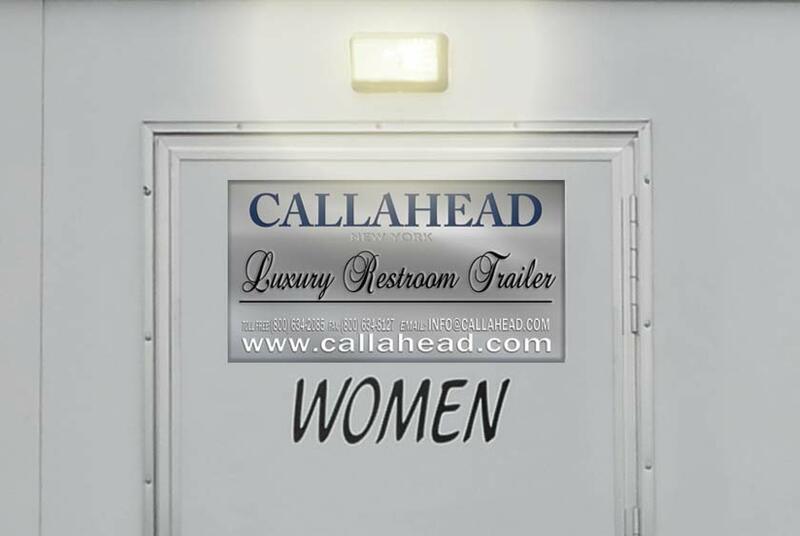 CALLAHEAD's signature "Luxury Restroom Trailers" signage is proudly displayed for every user to have peace of mind. The DRIFTWOOD'S wide floating steel framed staircases have stainless steel handrails and non-slip surfaces for safety. 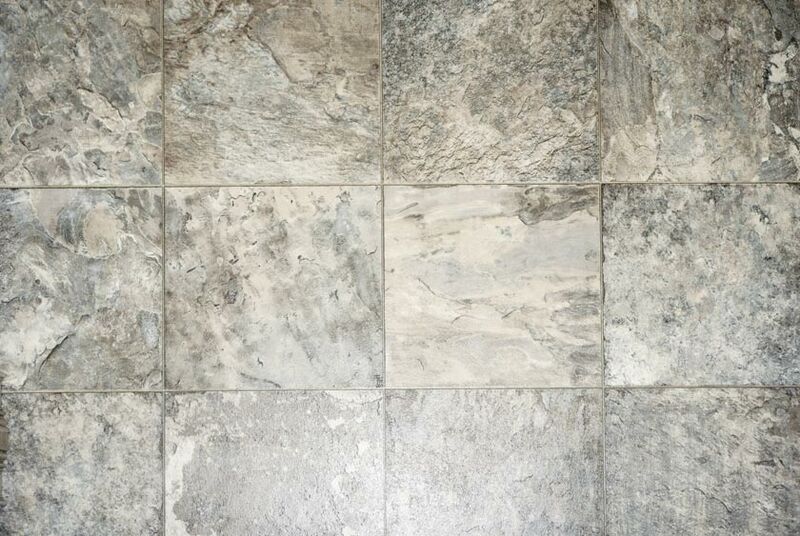 The restrooms interior flooring is faux granite and extends throughout the entire trailer. 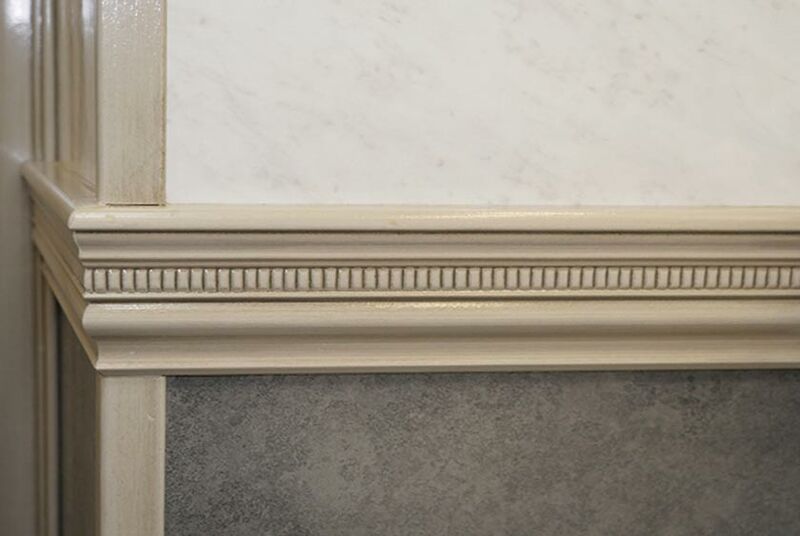 Faux granite walls go up to the chair rail moldings and gray and white Faux Carrara marble walls continue from the chair rail moldings up to the ceilings crown wood moldings. 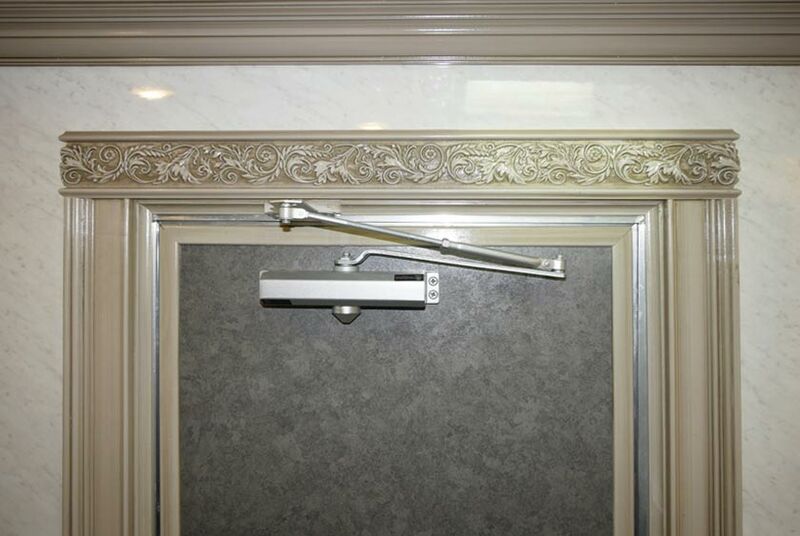 Extensive trim work includes base moldings, chair rail moldings, and crown moldings. There are also casement moldings around every door and skylight, and a frieze in a richly decorated vine pattern over the vanities and each stall door. The double sconce light fixtures were inspired by the grand age of ocean travel, to deliver a dashing nautical flair. The Art Deco style of these sconces feature banded glass shades, spherical accents and a brilliant chrome finish. The brilliance of the DRIFTWOOD continues throughout. 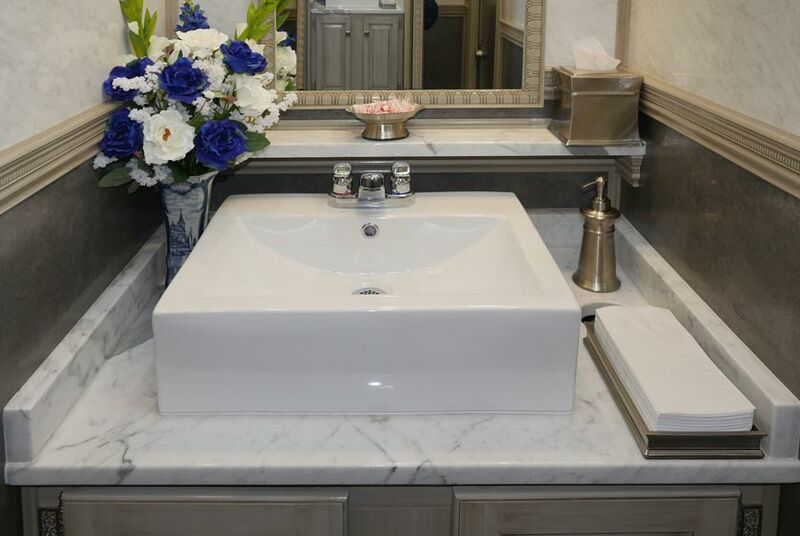 The vanity countertops are a gray and white statuary marble with modern square Kohler porcelain sink basins. Chrome Moen faucets have automatic shut off, to provide hot and cold running water. 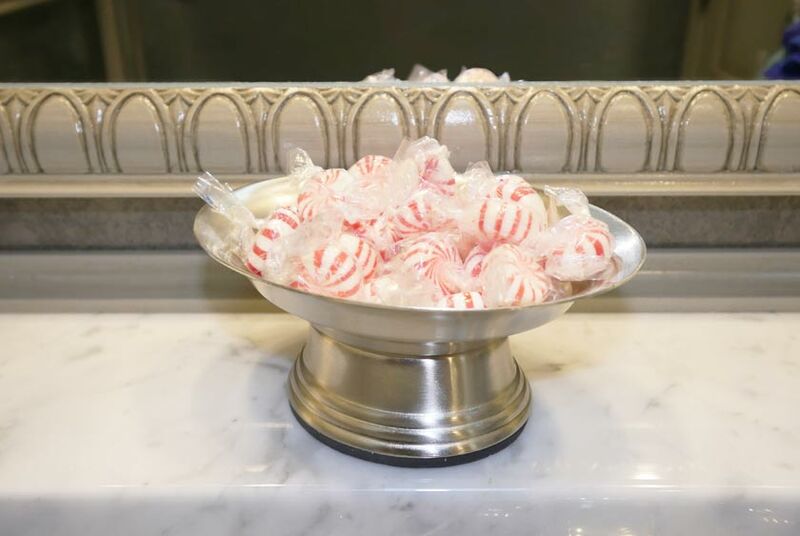 Decorative antibacterial soap dispensers, hand towels, filled tissue holders and candy dishes are also provided. 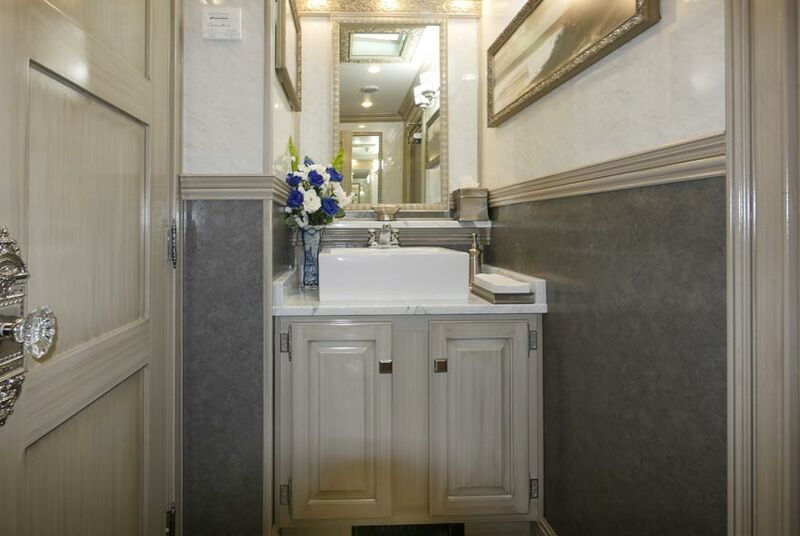 The vanity includes a built-in trash receptacle to help keep the restroom clean. There is also storage beneath the sink for extra supplies. 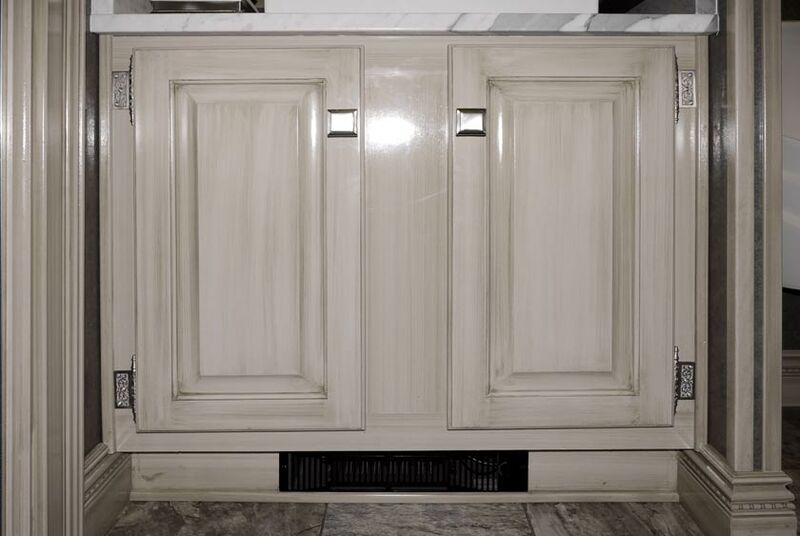 The storage cabinet doors are painted to match the stall doors and include oversized Regent cabinet knobs that epitomize transitional style. The elegant vine pattern of the solid brass steeple hinges adds opulence to the design of the cabinet doors. A large decorative vanity mirror above the sink feature an egg and dart frame with low voltage recessed lighting. 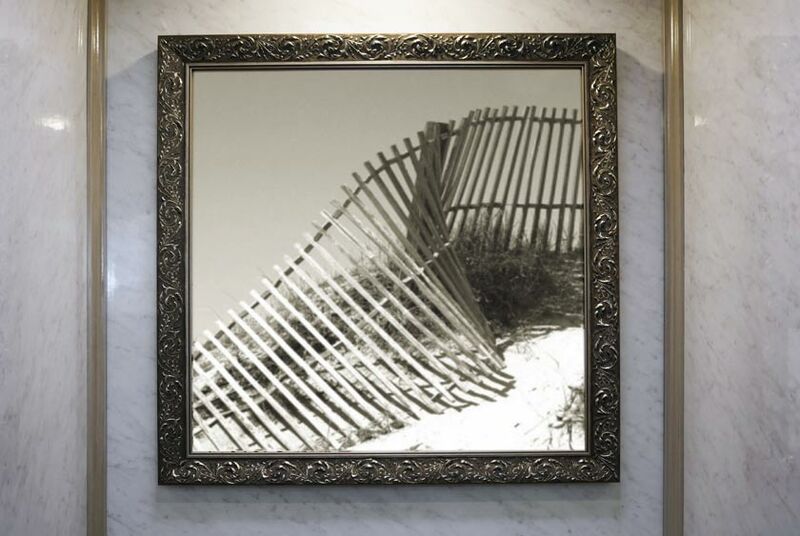 There is also a decorative full length mirror provided in both restrooms that will be appreciated by every well-dressed guest. The vanity area's custom made floral arrangement adds to the warmth and beauty of the DRIFTWOOD'S setting. The women's two private bathroom stalls have a porcelain flush toilet bowl and polished chrome toilet paper holder representing modern simplicity at its best. 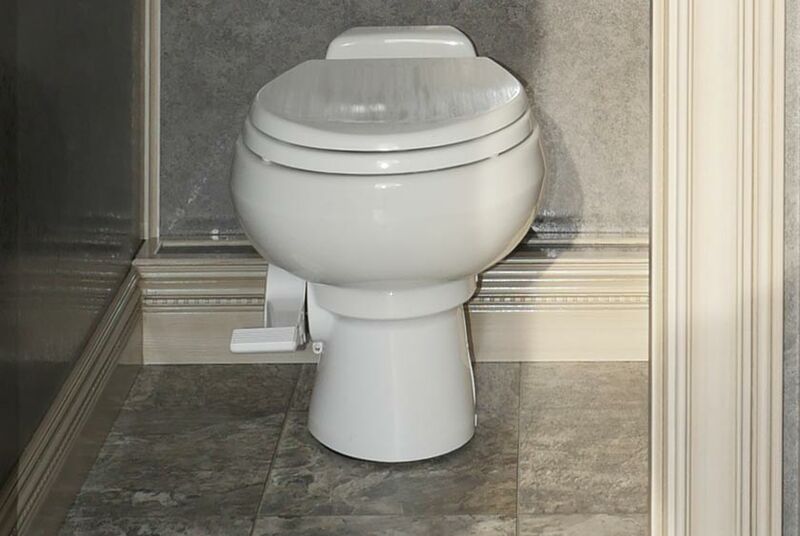 A pedal flush porcelain toilet bowl provides easy hands-free operation. There is also a personal trash receptacle in every stall. 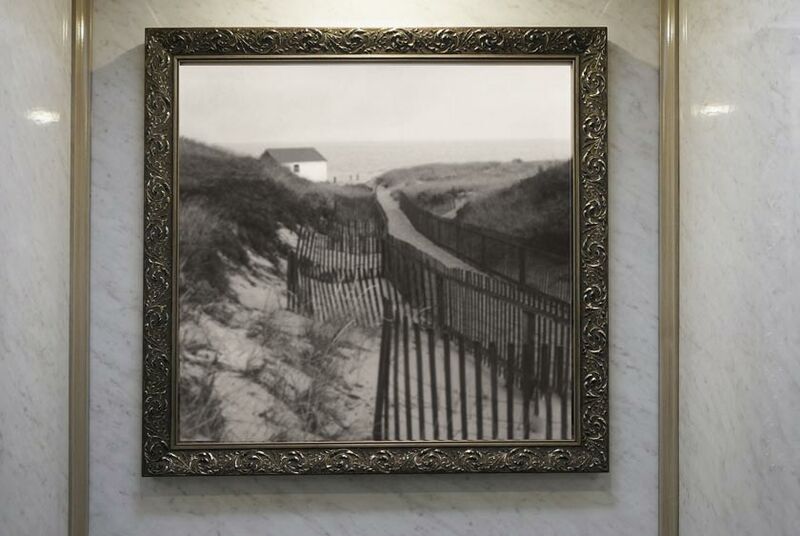 Throughout the restroom and each bathroom stalls are perfectly placed black and white beach prints in French antique style frames reminiscent of the Renaissance. 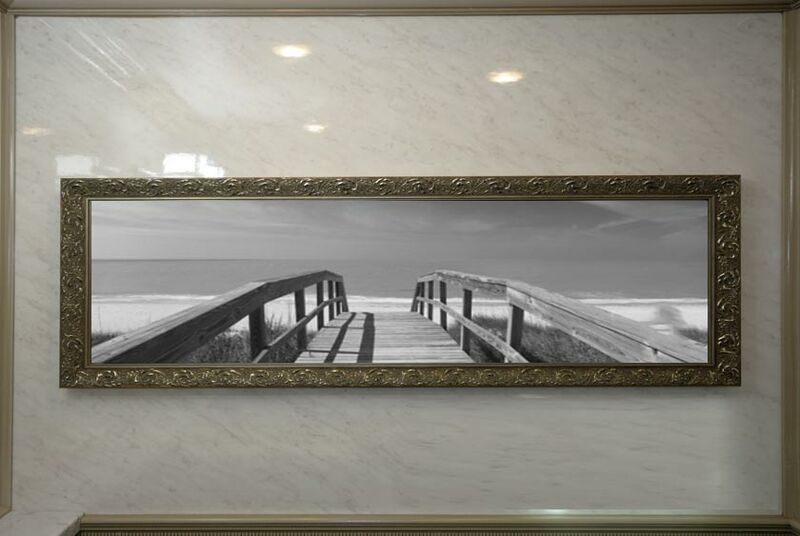 Each work of art was specially selected and custom framed for the DRIFTWOOD LUXURY RESTROOM TRAILER. 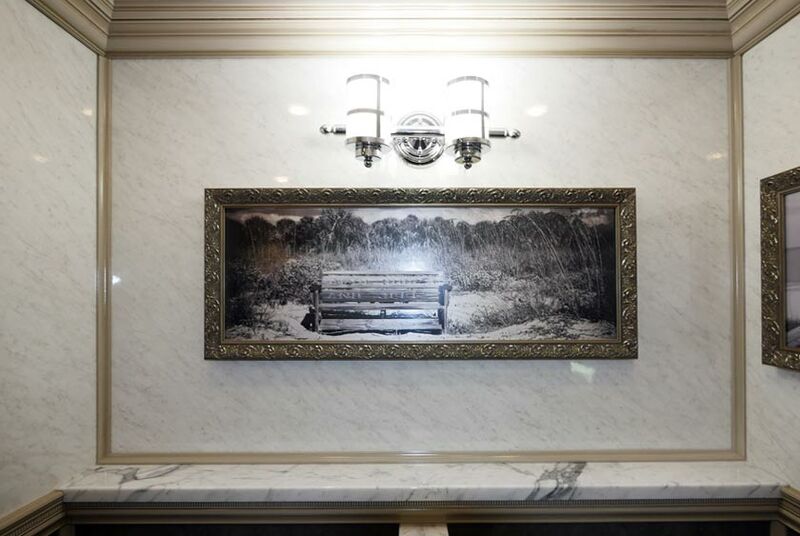 The men's restroom has one private bathroom with the eclectic décor and luxury elements just as the women's. 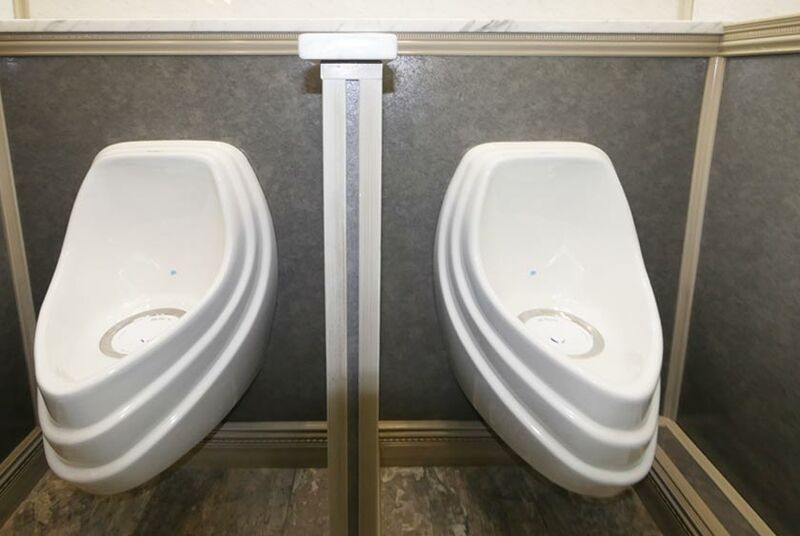 The men's side also includes two waterless porcelain urinals with privacy divider. 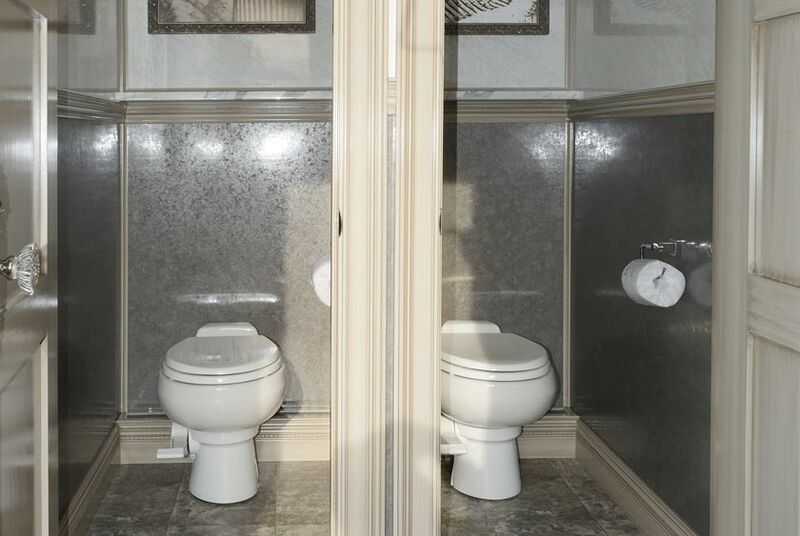 The privacy divider's elements include faux granite walls, trim work and statuary marble caps. There is also a statuary marble shelving area above the urinals. The DRIFTWOOD was designed by Mr. Howard selecting only quality equipment. 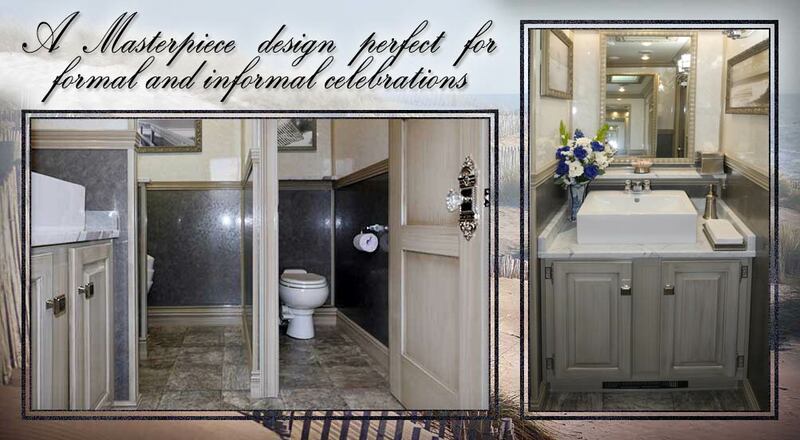 Only CALLAHEAD has luxury restrooms designed to mimic mansions, castles and luxury five star resorts. 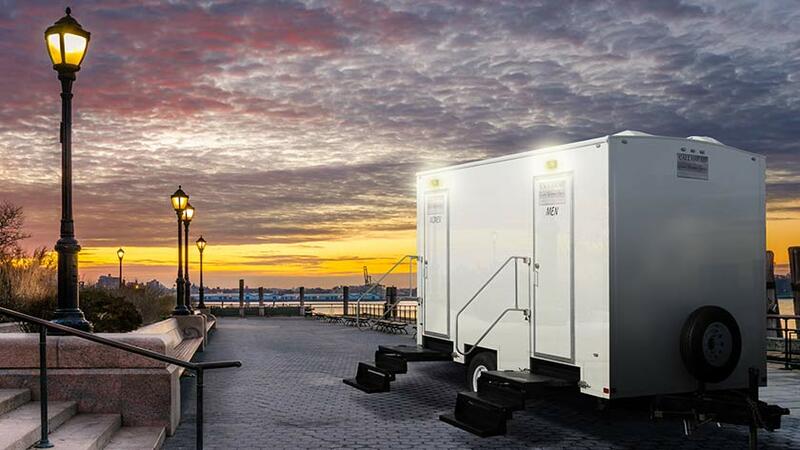 The DRIFTWOOD epitomizes New York luxury restrooms at its best and can be delivered throughout all of New York City's five boroughs of Manhattan, Queens, Staten Island, Brooklyn, and the Bronx, and all of Westchester, Nassau and Suffolk Counties. 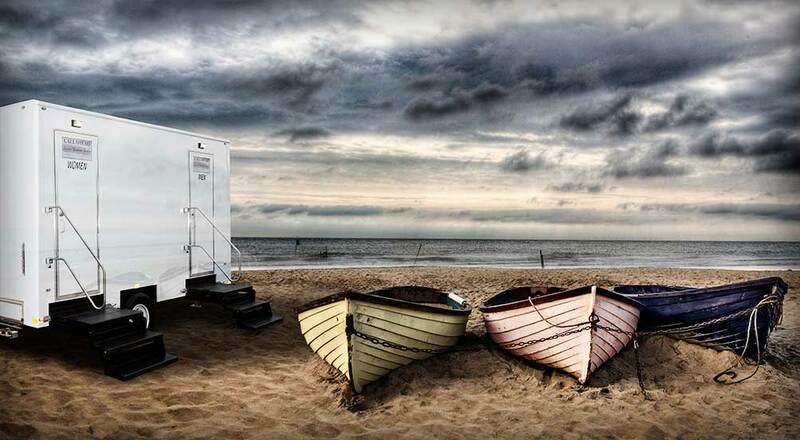 The DRIFTWOOD LUXURY RESTROOM TRAILER is a special event restroom rental for short-term needs. 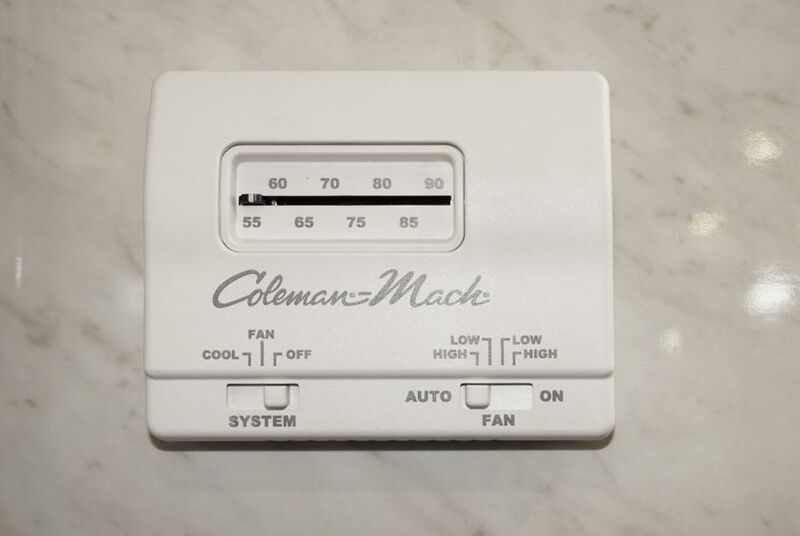 The DRIFTWOOD is fully equipped with a thermostat heat and air conditioning for year round comfort inside. There are also toe kick heaters for added comfort during the New York cold winter months. 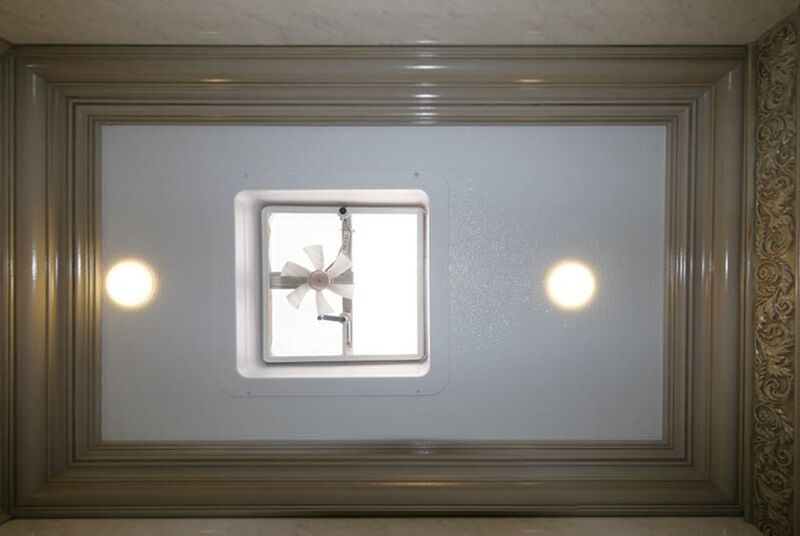 LED ceiling lighting and wall sconce light fixtures provide plenty of light inside the restroom trailer. 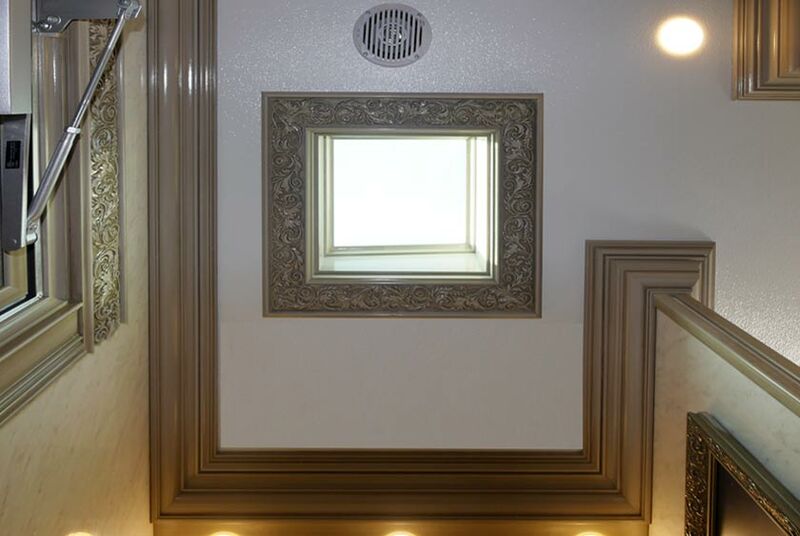 There are also skylights for natural light. Every private bathroom stall is also equipped with its own personal ceiling vent for extra ventilation when you want it. 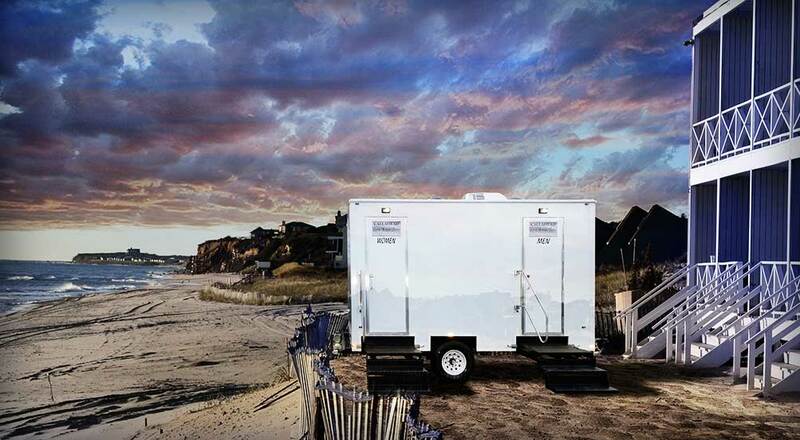 Electricity for the DRIFTWOOD LUXURY RESTROOM TRAILER runs from a standard 110 Volt outlet or generator. 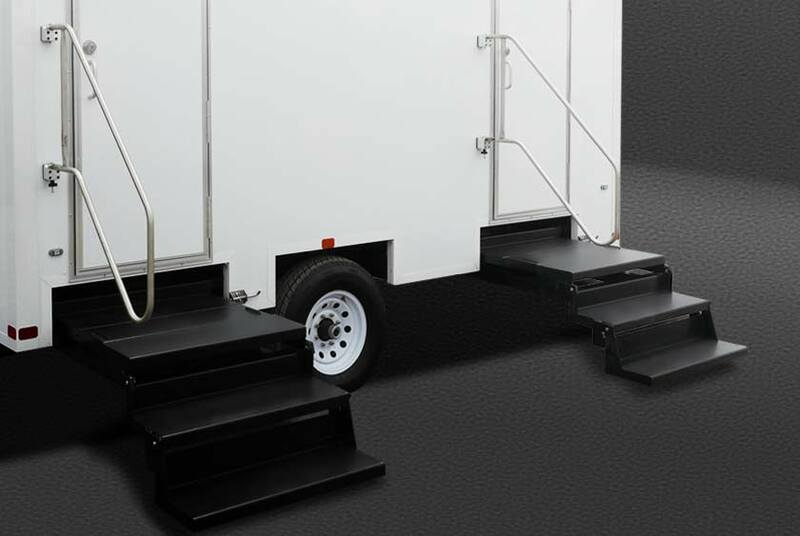 A CALLAHEAD professional uniformed delivery specialist will arrive to set up the restroom trailer at your location. Set up of the restroom trailer will take approximately 30 minutes. 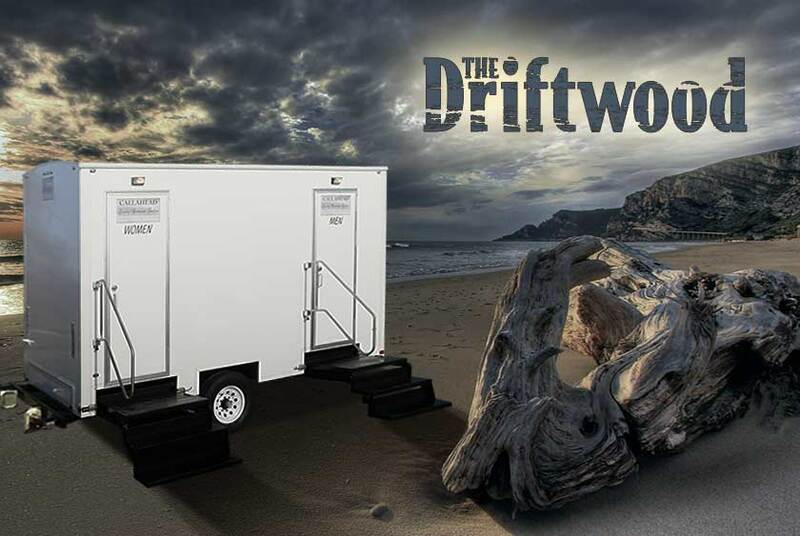 The DRIFTWOOD portable restroom trailer can handle use of hundreds of people at any formal or informal celebration. 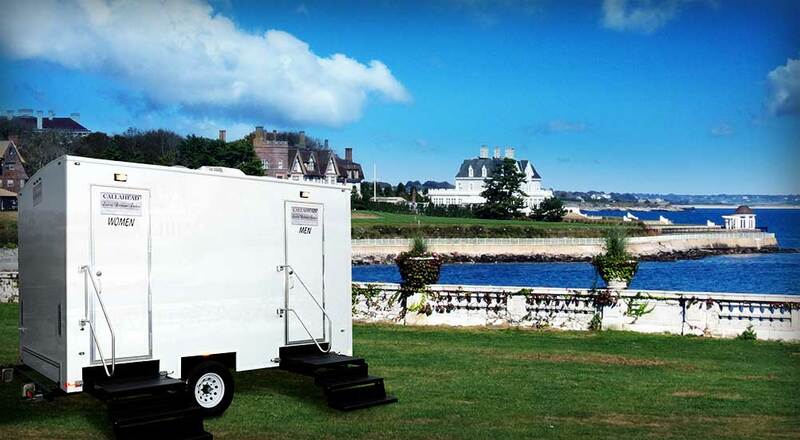 This luxury restroom trailer can also be hooked up to a 0.75" garden hose connection with a pressure regulator for fresh water hookup if needed. We only clean all of CALLAHEAD's equipment with only hospital grade cleaners and disinfectants to deliver only the highest sanitary equipment for our customers. 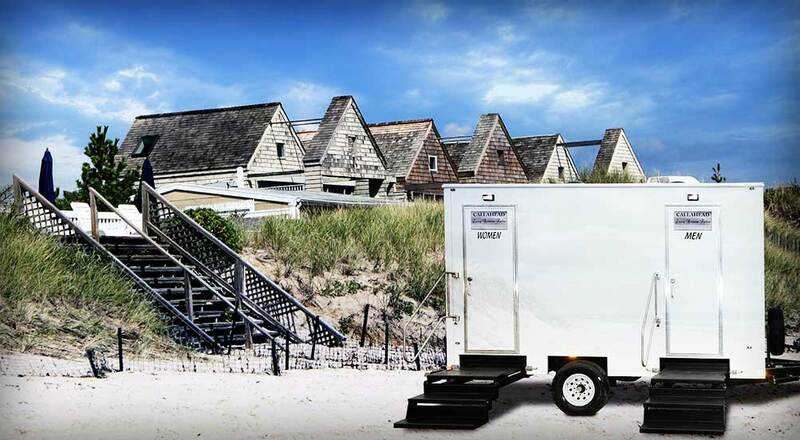 We also offer the option of a CALLAHEAD professional uniformed restroom attendant to keep the DRIFTWOOD LUXURY RESTROOM TRAILER RENTAL in perfect condition throughout your entire event. For more information about the DRIFTWOOD LUXURY RESTROOM TRAILER or any of CALLAHEAD's state-of-the art equipment including, VIP portable toilets, porcelain toilet systems for jobsite office trailers, security guard booths, fresh water and waste water holding tanks, fresh water delivery, commercial grade portable sinks, portable hand washing sinks, portable antibacterial and hand sanitizing dispensers, long-term and short-term portable toilet rentals, long-term or short-term restroom trailer rentals, portable shower rentals, and portable storage shed rentals, please contact one of our expert sales specialists at 800-634-2085 or visit our website for full photos, details and videos of our equipment for all your portable sanitation needs at www.callahead.com. Two fully enclosed bathroom stalls with lockable wood doors that go from floor to ceiling for complete privacy • Each bathroom stall is very deep and spacious • Every bathroom stall has porcelain toilets with a spring loaded pedal flush system so the toilet bowl will never stay running • Hands free flushing toilet bowls • Toilet bowls automatically refill after each flush adding the appropriate amount of clean water for the next user • To add water to the toilet bowl easily lift the pedal flush until the desired amount of water is achieved • Each bathroom stall is decorated with its own custom framed artwork. 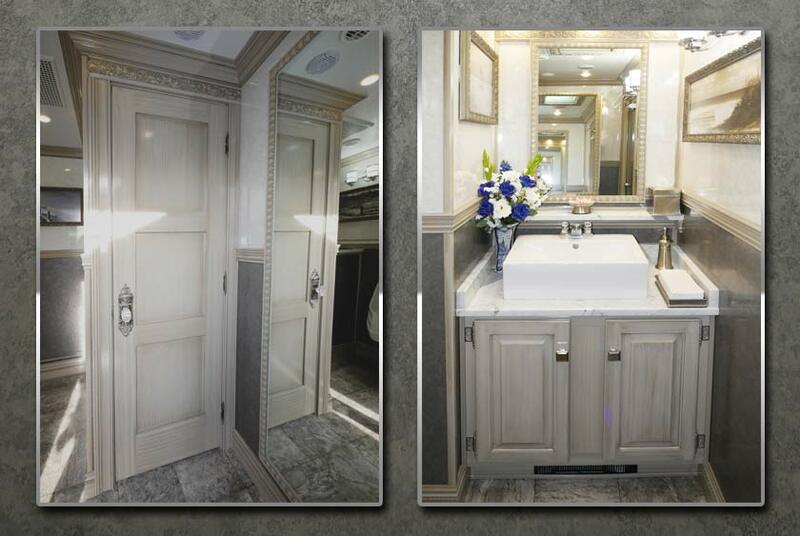 The DRIFTWOOD LUXURY RESTROOM TRAILER is the masterpiece design of Charles W. Howard, CALLAHEAD's President and CEO. 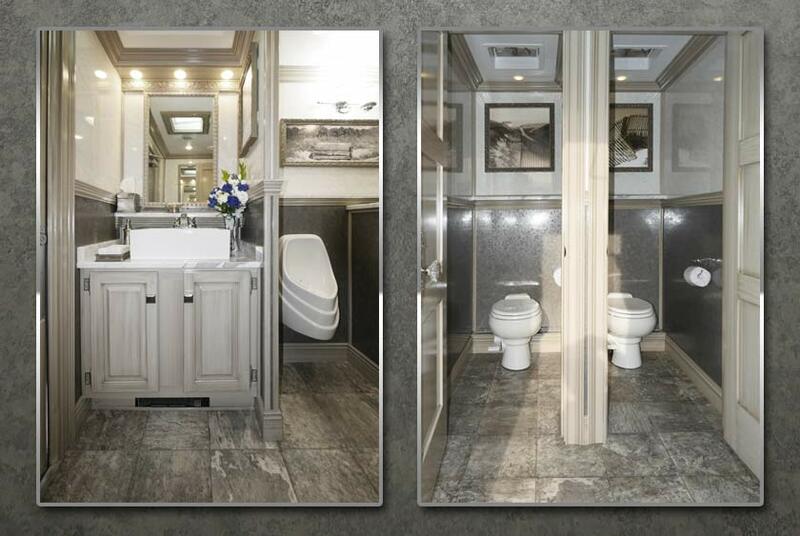 This exquisite luxury restroom trailer's eclectic design utilizes various shades of grey to create depth while blending together contemporary and old world decor. 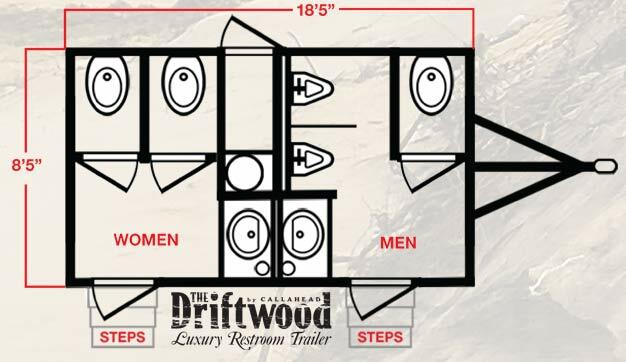 The DRIFTWOOD is an 18.5-foot luxury restroom trailer equipped with separate women's and men's facilities to deliver first class elegance. 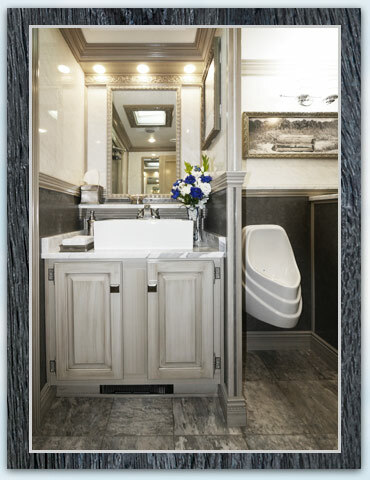 With all of the elements of the old world including, architectural trim work, faux granite flooring, faux marble walls, antique hardware combined with the modern elements of silver hardware, and grey coloring, the DRIFTWOOD is the elitist in restroom trailers. 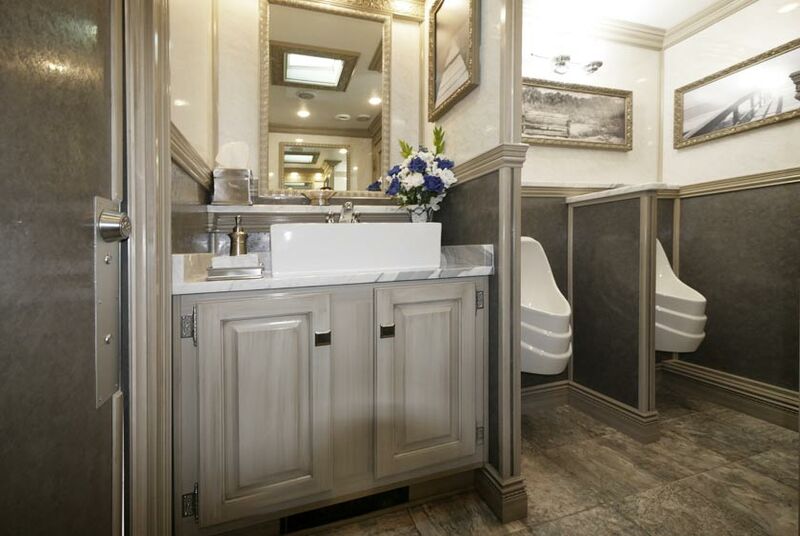 The DRIFTWOOD LUXURY RESTROOM TRAILER provides 5-stations of comfort to accommodate any formal, informal or other social gathering when you want to provide the best sanitation experience for your guests. 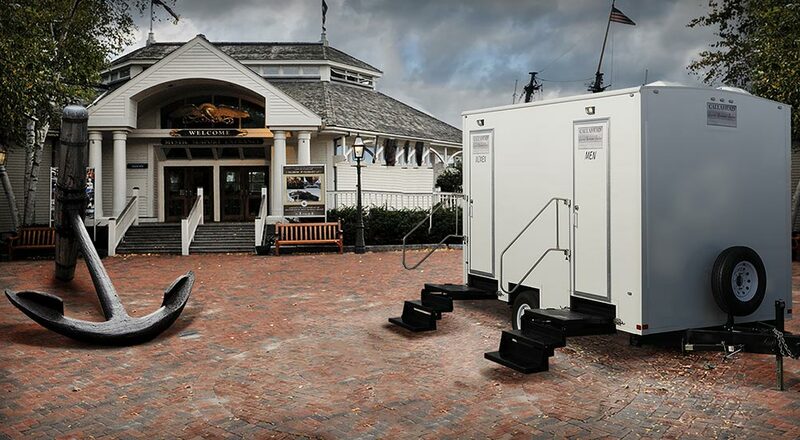 This is a short-term restroom trailer rental that arrives fully stocked with all the luxury amenities included. 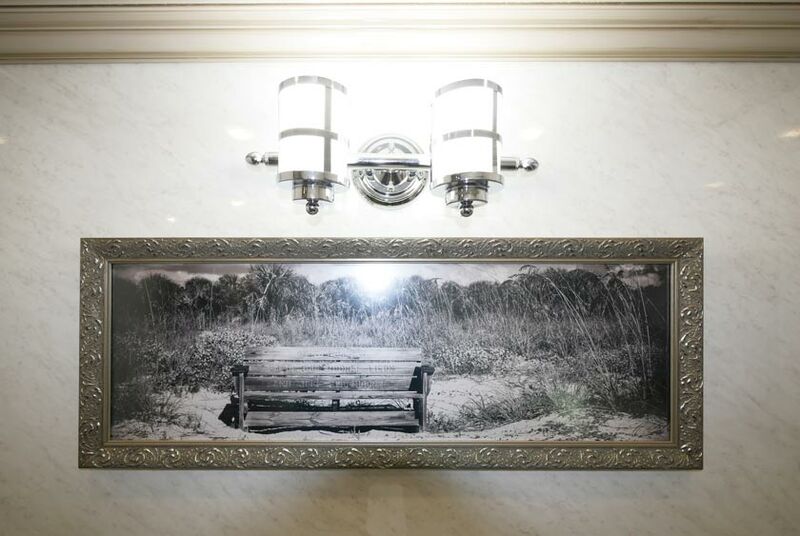 The DRIFTWOOD adds to the VIP experience by providing all of the extras which include elegantly framed art work, beautiful floral arrangement, designer soap dispenser, hand towels, filled tissue holder, candy dish, surround sound music system, and thermostat heat and air conditioning. The men's and women's restrooms are equipped with private bathroom stalls with Sealand white porcelain flushing toilets and Sloan white porcelain waterless urinals (men only).